The fire raged all around him. The smoke was so thick he couldn't see which way he'd come from or which way he needed to go. He turned from side to side growing more anxious. Intense heat swirled around him. His clothes were soaked with sweat and clung to his overheated body. Flames shot up the walls and across the ceiling. He could hear the crackling of weakened timbers. The ceiling bubbled and sagged. He knew that any minute it would come down on him. He could hear his own strangled screams for help, "Roy! Help me! Which way Roy? Help me!" He turned from side to side searching for escape. Suddenly he felt coolness on his face. His thoughts were muddled, confused. How could he feel cool in the middle of an inferno? "It's okay sweetie, just a bad dream. Wake up for me now," Joanne spoke soothingly like she would to her children. "Come on Johnny, wake up now." Slowly he calmed to her touch. The damp cloth she wiped his face with helping to bring him back to reality. His brown eyes opened slowly, blinking several times trying to clear the fogginess from his brain. "J Jo?" "Yes Johnny, I'm right here. You had a bad dream, but it's okay now." She reached over to the bedside table and brought him a glass of water. He sipped the cool liquid. His eyes wandered the room trying to remember where he was and why. "Your house?" Joanne smiled at him as she bathed his face again, "Yes Johnny, my house." She giggled at him, "Don't you remember? Roy had to work today, and the kids are at school." "Oh, I forgot." He closed his eyes. His head ached making him feel dizzy and sick. "Are you still sleepy Johnny?" "M hm" His breathing evened out again sleep claiming him. Joanne got up slowly from her spot on the side of the bed trying not to wake him. She knew he hadn't slept well and hoped he wouldn't have anymore bad dreams. In sleep Johnny's thoughts were mixed with things he had read in "The Fire Talks" and things he thought were memories. The problem was he didn't know the difference between what was real and what was fiction or if it was all real or all fiction. Joanne went to the kitchen phone and dialed the familiar number. "Station 51 Fireman Stoker speaking." "Mike, this is Joanne Desoto. Could I speak with Roy?" "Hello, Joanne. Roy's in Cap's office. Um the doors shut. Can I have him call you back?" "Oh sure Mike, or I guess you could give him a message for me. Could you tell him that Johnny had another bad dream? That he woke up screaming for Roy to help him. Roy wanted me to let him know how things were going today. I got Johnny to calm down, and he went back to sleep." "Okay Joanne I'll be sure to tell him. Do you want him to call you back?" Mike thought that it might wake Johnny if Roy called, but if Joanne needed him to he would make sure that he did. "No thank you. It might wake Johnny. He didn't sleep well last night. I'll call back later when he's awake. Good bye Mike and thanks." She hung up the phone and went back to her chores. Mike hung up the phone and went back to his coffee. "Was that Joanne?" Chet asked. "Is everything okay with Johnny?" "Bad dream." Mike was not a man of many words and didn't elaborate. In the office Hank and Roy were discussing the Chief's plans. "I don't know why he didn't tell us Cap, and now he doesn't even remember," Roy said biting his lip nervously. "How are we going to get him to agree to this if he doesn't even remember doing it?" "Well we have one week to sort that out Roy. The Chief said it was going to be a big press conference important to the department. He knows Johnny is recuperating from a very serious concussion and wanted to give him time to get better before the presentation. I don't know how, but we have to help him remember." "Dr. Brackett said we shouldn't push his memories. He may not ever get them all back. He's said a few things that make me think he will. He remembered that cat the other day that scratched his arm. He told Jenny about it being a tabby cat. He also told her that Chet's spring mechanism on his water catapult had broken and that was how he hurt his eye. I don't think anyone had told him that." "That's great Roy. Maybe we need to have Joanne bring him by the station in a couple of days. It might help jar some more memories." Captain Stanley suggested. "How is he doing otherwise?" "He's still pretty dizzy and nauseous. The headaches are really bad. He couldn't eat dinner last night. I got him to drink some broth before he went to bed, but he's losing weight from not eating. This has to be the worst concussion he's had." Captain Stanley could tell that Roy was very worried about his partner. "He'll be alright Roy." "I know Cap. I just hate to see him this way. You know how he is. He'll beat himself up trying to remember." "He will, but he's getting the best of care at your house. He feels safe there Roy. You, Jo and the kids are his family. Things will work out. We just need to make sure he's ready for this shindig the Chief is planning, okay?" Captain Stanley rose from his chair signifying the end of their meeting. "Let's get some coffee," Hank led the way to the kitchen. When they entered the dayroom Mike told Roy about Joanne's phone call. "She said she would call you later when Johnny was awake. She didn't want the phone to wake him up. She said he didn't sleep well last night." "No, no he didn't. I heard him tossing and turning all night." Roy sat at the table and stared into his coffee cup. "Maybe he can rest better today while the kids are at school." The afternoon and night passed quickly for Johnny. He slept or at least he tried to sleep most of the day. He had struggled with a throbbing headache and more dizziness. When Roy's kids got home from school he forced himself to get up and spend some time with them just as Roy had known he would. They had played Operation, a game where the game board was a picture of the patient on an operating table. The object of the game was to pull things out of the patient's body with tweezers, but you couldn't touch the sides of the hole where they were because it would set off a buzzer that lit up a light on his nose. Then you had to leave the item in the hole and lose your turn. The constant buzzing and laughter that followed didn't help his headache, but he would do anything for Roy's kids. He was able to join Joanne and the children at the dinner table without getting sick. Granted he didn't eat as much as he usually would have, but he did eat some. Thankfully Joanne knew he was struggling to stay awake after dinner. They had all gone to the living room to watch TV. Joanne sent the children upstairs early. They complained, but went as instructed. She had promised to come up after their baths and read to them. They had begged for Uncle Johnny to read, but she told them he was tired and needed to rest; for that he was thankful. Johnny spent another night tossing and turning. His dreams mixed with more memories and thoughts that confused him. When he awoke he didn't recall everything from his dreams, but he did know enough to be stressed and even more confused. It was almost 9 o'clock when he found his way down the hall. The house was quiet which was strange at the Desoto home on a school day morning. Realizing that the kids would have already left for school he went in search of Joanne. He went to the kitchen and found a note on the table explaining that she had gone to run some errands. He started a pot of coffee, and retreated to the deck. Roy came home from work a little later smelling a fresh pot of coffee. Knowing Joanne was not home since her car was not in the garage he went to the kitchen expecting Johnny to be at the table with a cup of coffee, but he wasn't there. Roy walked over to the sliding glass door and looked out to find Johnny on the deck frantically looking through the novel. He grabbed two cups of coffee and joined him on the deck. Johnny looked up at Roy with a wrinkled brow. "No, Yeah. Roy it's...I mean...I think there is something I wanted to tell you, that I need to tell you." He ran his hands through his hair and rubbed his eyes. "It's real important, but I...you know I think I was waiting to be sure it all worked out." He looked at his partner for understanding. His hands pulled nervously at the rumpled corner of the novel. "I just...I can't remember...this book...it all seems so, so real to me...like...like I wro...no never mind. That's crazy. I guess it's just so much like the fires we've fought and I can't remember the last six months, and it's all just mixed up. I'm so mixed up Roy." He ran shaky fingers through his hair again. "Have some coffee Johnny. You need to calm down. You'll never remember if you keep stressing yourself out." "I know Roy, but whatever it is, it's really, really important. I wanted to tell you the other day, before..."
"Johnny, you will. You will remember and you will tell me whatever it is. I believe you will get your memory back, but forcing it won't help." "But Roy, I know….uh I think whatever it was….I feel like I was worried….I didn't want you to be upset with me. I was…." He looked into Roy's kind blue eyes. Roy could see the sincerity in his best friend's deep expressive eyes. Johnny's eyes were like windows to his soul. "I was afraid Roy." "Of me?" Roy asked suddenly feeling a little upset himself. Why would Johnny be afraid of him? Of any reaction he might have to what he wanted to tell him? They were best friends. They'd saved each other's lives countless times. Surely Johnny knew nothing would ever change their friendship. Johnny's eyes lowered to the table, and he began thumbing the novel again. "I thought you would be mad at me for not telling you." Roy understood now. Johnny was going to tell him his secret, and that made him very happy, very happy. His best friend was not going to keep one of the most significant things in his life from him any longer and that was a relief. He suspected that Johnny had kept it from him in the first place because of doubt and insecurity. That was something Johnny struggled with a lot. He knew about it now, but Johnny didn't know that he knew. He wasn't mad. He thought he understood why Johnny had not shared his secret, but Johnny didn't even know what that secret was right now. How could Roy ease his friend's upset when Johnny didn't even know what it was he wanted to tell him? There was more to the situation that even Roy didn't know. Captain Stanley and the Chief had agreed that they would wait until the presentation to reveal that part. Johnny should be there when Roy got the whole story. "I wish….I mean now I don't….If only I could remember." "Johnny," Roy waited for Johnny to look at him, but he didn't. He tried again, "John." The use of his given name brought Johnny's attention to his friend. When Roy called him John he was either mad or trying very hard to get him to pay attention. "Nothing you could ever do or say would change the fact that you are my best friend, my brother." He paused waiting to see that Johnny had listened. "Nothing. Understand?" Johnny nodded his head in recognition of the truth Roy spoke. "I know Pally, thanks." Now wanting to change the subject especially since he didn't actually remember what it was he wanted to tell Roy he directed the conversation to work, "Were you guys busy at the station?" Roy and Johnny sat talking on the deck for a while enjoying their coffee. "We had some crazy runs today." "Who did you pull for a partner?" Johnny asked half heartedly. He wanted to hear about Roy's day, but he really missed being beside him in the squad. "Oh uh Dwyer worked again. He said he owed you." Roy chuckled. "He did? 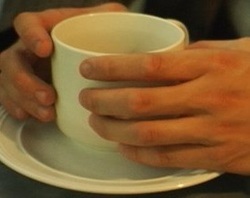 I…I don't remember," his eyes downcast he twisted the coffee cup nervously in his hands. Roy didn't dwell on the subject, "Yeah well we got called out first thing on shift to a kid trapped. It turned out to be a six year old boy with his foot trapped in the window to his sister's doll house. Then our second run was for a brush fire. That one turned out to be a fire that started from a camping lantern that tipped over in a barn and caught the horse's brush on fire." Both men laughed at Roy's story. "No way," Johnny shook his head laughing. "Yes way." Roy could see his friend's shoulders relaxing. The stress lines on his forehead eased. The smile he now wore was genuine and shown in his eyes. "Would you like some more coffee?" "That would be great." Johnny still smiled and chuckled, "Brush fire." Roy went into the kitchen and returned with two freshly filled cups. "Have you had anything to eat this morning?" Johnny ducked his head embarrassed. He had spent so much time thinking about that book that he hadn't even thought about breakfast. "Uh…no…not yet." "Junior, you need to eat. How do you expect to ever get back to work if you don't eat? You know if you lose too much weight Brackett won't clear you for duty. He's always saying you're too thin, barely making department standards." "I know Roy, it's just that…." "Don't just that with me Junior. What do you feel like eating?" "I'm not really hungry." Johnny pushed the half empty coffee cup away. "I uh….I really have a headache now from all that concentration earlier." "Well I think you may have a headache from not eating. It's almost lunch time. How about a scrambled egg sandwich? That could serve as brunch, then some Tylenol, and we can both lie down for a while." "Okay." Johnny started to get up. "Stay put. I'll be right back." Roy rose from his seat, grabbed the coffee cups and disappeared once again into the kitchen. When he returned he had a steaming scrambled egg sandwich and a tall glass of cold milk. He placed it in front of Johnny. "Eat." Johnny looked up at Roy sheepishly and reached for the sandwich. "Oh I almost forgot. I brought your bag from your locker. Chet and Marco drove the Rover over to your apartment. I'll get the keys from them later. I put the bag on your bed. I know you had some notes on that legal pad about Jennifer's birthday, or at least that's what you said. It's in Lakota so I'm not really sure what it says." "Really? I'll take a look at it later. Jennifer's birthday is coming up?" Johnny looked at Roy for confirmation. "Well yeah in a couple weeks. We were planning a party. You were going to get her something special, a doll or doll house I think." "I was going to make her one." Johnny said absently. Roy immediately picked up on the memory that Johnny seemed to not realize he had just had. "Yeah, yeah you had written out plans for it. You didn't want Chet to know about it. You thought he would make fun of you for it." Roy smiled at Johnny's desire to please his little girl with a special gift made by his own hands. "I'll look at it later. I think I'll lie down for a while. I'm not feeling too well all of a sudden." "Johnny let me look at your arm. I think we may need to change the bandage or let it air some. That cat scratch was awfully infected." "It's alright Roy. It's almost healed anyway," he shrugged. "My eye's better too. Now if I could just get my brain better…." He chuckled at his own joke. "Okay Junior. I think I'm ready for a nap too." Both men rose from their seats. Johnny reached for the dirty dishes. Roy pushed his hands away and picked them up. "You need to concentrate on not getting dizzy or stumbling." Roy followed Johnny into the house stopping by the sink to deposit the dishes, and then down the hall to the spare bedroom. "Roy I can find my own way," he declared with his hands on his hips and determination on his face. "Tylenol!" Roy snapped his fingers and hurried back to the kitchen. Johnny continued into the bedroom, grabbed the bag and moved to place it in the chair that sat in the corner of the room. Stopping he unzipped the long zipper exposing the contents. There it was the notepad. Johnny reached for it pulling it from the bag. Turning it over he read the first page. "Jennifer's birthday doll house should have at least three bedrooms, a kitchen, a bathroom, and a den," he chuckled at the elementary plans he had written. Flipping the page he found actual sketches of the house he planned on building. The measurements were there as well as the list of supplies, all written in Lakota. He reached up and ran his hand through his hair. He remembered the plans. He turned to the next page. He trembled with the realization that there was much more to this notepad than the simple plans for Jennifer's birthday surprise. He stood staring at the words on the page realization overtaking him. He began breathing fast, almost panting, hyperventilating. He dropped the notepad. The room spun. He reached for a handhold on the bed, missing it and slipping to his knees. "Johnny! What happened?" Roy ran over to his friend and helped lower him to the ground. "You're hyperventilating. Slow your breathing Junior, in through your nose and out your mouth. I'll be right back." Roy dashed from the room to find a paper bag. Johnny now fully stretched out on the floor panted for breath. He tried to breathe as Roy had instructed him. His mind knew what he needed to do, but his body wasn't cooperating. "Here Johnny breathe into the bag." Roy held the bag in place for Johnny. "Come on now. Slow down. Take deep slow breaths." Johnny complied. Slowly his breathing returned to normal. "What happened?" Roy asked him as he helped him sit up. "The notepad," he pointed. "I read…I uh…in the…on the third page. I wrote something…something in Lakota." He rubbed shaking hands up and down his pale face. "I know Johnny the whole notepad is written in Lakota." "Yeah, but there are notes for…Aw that's just crazy…I couldn't have…"
"Roy…I need…" he raised his hand to his mouth and brushed past Roy to the bathroom. After Johnny finished flushing and washing his face he walked slowly back to the bedroom and slipped beneath the covers of the bed. Johnny took the proffered tablets and water. "Thanks Roy. Thanks for everything." He lay down and pulled the covers over his shaky body. "What was in the notepad Johnny?" "I can't talk about it right now Roy." He threw his arm over his eyes. " I don't feel like talking about it." Roy turned out the light and left his best friend to think about what he had read. He didn't know what the words were, but he suspected what they might have been about. He hoped he hadn't pushed his friend too hard to remember, but the Chief had only given them a week to get Johnny ready for the presentation. After all Johnny had already started remembering.